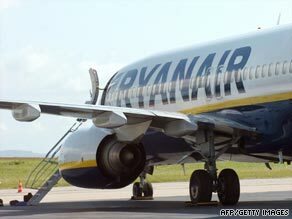 LONDON, England (CNN) -- Budget airline Ryanair announced plans Tuesday to cut its winter flights schedule from its main UK hub, blaming a collapse in the British tourism industry, rising airport costs and "insane" aviation taxes. Ryanair is reducing its fleet at Stansted Airport from 40 planes to 24. The Irish carrier currently operates 40 aircraft out of Stansted Airport, near London, but it plans to cut capacity by 40 percent to 24 aircraft by October 2009. That will mean a 30 percent drop in the number of weekly flights and a loss of 2.5 million passengers between October and March 2010, Ryanair said in a statement. But BAA, which runs Stansted, disputed Ryanair's claim, pointing out that the carrier routinely reduced its fleet during the winter -- and that the airline was one of the most profitable in the world. "Today's announcement means it is business as usual here at London Stansted," said the airport's managing director Stewart Wingate. "Last winter Ryanair reduced its aircraft fleet here to 28, this year it will be 24. It is common practice for them to reduce frequency to various destinations during the winter season as they have done in previous years." Ryanair Chief Executive Michael O'Leary said the move was motivated by the refusal of BAA to cut passenger fees despite falling traffic, including a six percent drop during June. O'Leary also criticized government plans to raise Air Passenger Duty levied on travelers by £1 ($1.6) to £11 ($18) on short-haul flights, calling the tax "insane and damaging." "Sadly UK traffic and tourism continues to collapse while Ryanair continues to grow traffic rapidly in those countries which welcome tourists instead of taxing them," O'Leary said. "Ryanair's 40 percent capacity cutback at London Stansted shows just how much (British Prime Minister) Gordon Brown's £10 tourist tax and the BAA Monopoly's high airport charges are damaging London and UK tourism and the British economy generally." Ryanair said it planned to switch capacity to countries which had scrapped tourism taxes and passenger fees, including Belgium, the Netherlands, Greece and Spain. The UK government argues that Air Passenger Duty forms part of its strategy to reduce the environmental impact of aviation amid wider efforts to cut the country's carbon emissions. Financial minister Alistair Darling announced reforms to the existing system last November, introducing four bands ranging from £11 for destinations within 2,000 miles (3,218 kms) of London to £55 for flights of more than 6,000 miles (9,654 kms). Darling told lawmakers he believed the new system would be "effective in reducing emissions from aviation." Last month Ryanair reported a €169 million ($240 million) loss in the last year -- compared with a profit of €390 million the previous year -- after being hit by higher fuel costs and a writedown in its investment in rival Irish carrier Aer Lingus.